With The Chinese Room’s latest game, Everybody’s Gone to the Rapture , out today, we look back at the studio’s first two games. Dear Esther is the closest thing I have to a pilgrimage. I start on the shore, momentarily disturbing the still life of grass and rocks with my slow footsteps. In the distance I see a radio tower, its light blinking red through the fog of dusk. It’s all so achingly familiar now. I have been here before and I will return here again before long. Despite all my efforts I can never get far away enough to think I can exist without this place. Dear Esther is a particular kind of horror game, one that actively encourages projection and self-insertion. There are no jump scares. Nothing resembles the slowly building dread of psychological horror seen in Silent Hill. There are high stakes in those games, with the protagonist’s life or fate of the world hanging in the balance. In Dear Esther the cause is already lost. There are no great battles to be fought, no one to save. The games created by The Chinese Room are worlds of mourning where grief is etched into the walls, where we are allowed to explore the ruinscapes of our shattered selves. These are places of breathtaking beauty. Every inch of Dear Esther’s island is gorgeous, from the abandoned lighthouse that greets you to the soggy paper boats you find on the far shore and the caves that make up the belly of the isle, but I’m talking about more than the kind of beauty that’s pleasing to the eye. Much has been written about Dear Esther’s narrative, with authors putting together wikis, videos and articles explaining what they believe the story is about or offering a series of possible answers for common questions about the game. Who is the narrator? Why does the number 21 show up so much? Why is the game named after a character you only hear referenced a handful of times? Who does the player control? So on, so forth. I can understand the merit and joy that lies within attempting to piece together a story like this, but it’s not a task that’s of interest to me. Dear Esther is best left as an unsettling howl of grief into the sea wind. What the game evokes is far more interesting than the specifics of a plot that’s nebulous at best. To that end: this is a game largely concerned with ghosts. There are actual spirits you see from time to time if you’re looking in the right spots, but the presence of these specters is nothing in comparison to the ghosts of pain present in the narrator’s voiceovers, all of which play in sequence as you make your way from one end of the island to the other. He tells you about an 18th century shepherd killed by disease, a fatal car crash and tales concerning his own research on the island, but we’re only ever given bits of these stories and how they might tie into each other, which is ultimately irrelevant in my eyes. All that matters is these are stories of pain, of longing and loss, the kind of stories that are easy to relate to or at the very least comprehend on an emotional level. We’re all haunted in one way or another by ghosts like these. People we’ve hurt or lost, moments when we should have gone left instead of right. The real ghosts on the island are not the peek-a-boo figures in the distance, they are the things we’ve done and the things that have been done to us. They’re shame, regret, that creeping feeling that a poor decision you made years ago is finally about to catch up to you. Overwhelming desolation and isolation are what Dear Esther evokes so well. We are often alone with the crap that drags us down day in, day out in a world largely unconcerned with our baggage. Yet there’s an odd comfort in coming face to face with that realization, especially in a simulated environment created by a team of people who, being people, probably have at least some variation of some of the same hang-ups we do. From here I can see my armada. I collected all the letters I’d ever meant to send to you if I’d have ever made it to the mainland but had instead collected at the bottom of my rucksack, and I spread them out along the lost beach. Then I took each and every one and I folded them into boats. I folded you into the creases and then, as the sun was setting, I set the fleet to sail. Shattered into 21 pieces, I consigned you to the Atlantic, and I sat here until I’d watched all of you sink. The loss in these words is so profound—lonesomeness and self-loathing strung through each and every syllable—that it hurts even more to hear the narrator read them as though he had written them in the heat of the moment and was now just gazing upon them for the first time in full comprehension of what they meant, introducing himself at long last to the wailing tortured thing that had been growing inside him all along. 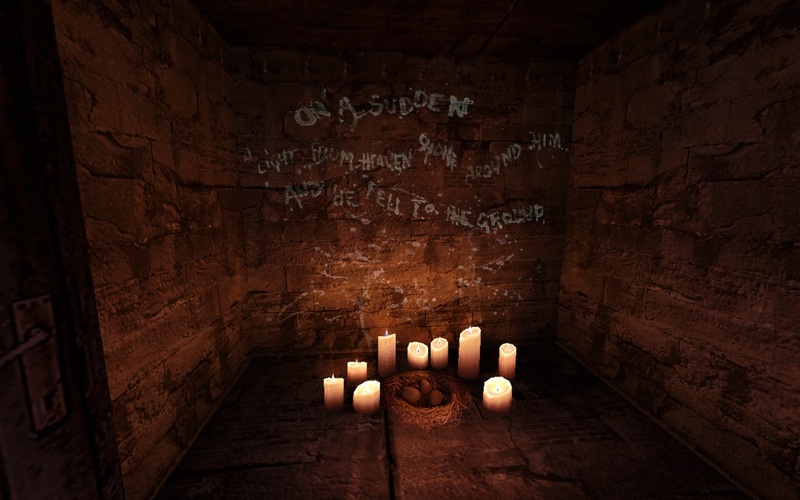 Amnesia: A Machine For Pigs, developed together by The Chinese Room and Frictional Games, is likewise a horror game that deals with the devils inside us. The story is more straightforward than Dear Esther, being lined within the walls of a popular indie game series adored by Youtubers for its jump scares, but the thematic material in Esther is here as well. 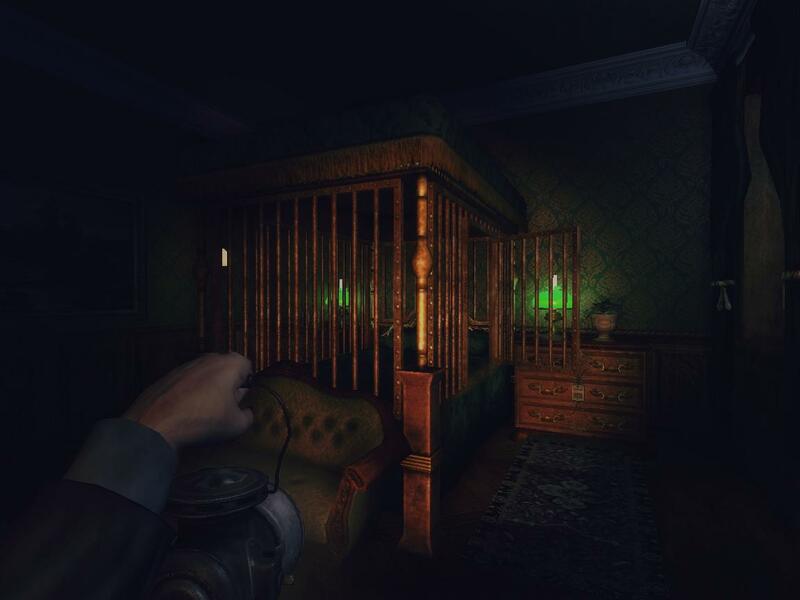 Oswald Mandus, the game’s industrialist protagonist, wakes up in his London mansion on the last night of 1899 to find his two children are missing. He descends into the great mechanical caverns beneath his estate to find them. Eventually it’s revealed that Mandus discovered a mysterious orb artifact in Mexico during a past excavation, one that gave him visions of the future, including one where both his children are killed in the first World War. Mandus, probably controlled by the artifact, kills both his children to prevent them from dying an agonizing death in battle. A sprit then took over Mandus’ mind, convincing him to build a massive machine beneath the streets of London powered by human sacrifice that would somehow prevent the bleak future from coming to pass. By the time the game has begun, he and the spirit have split, with it taking up residence in the machine itself and an amnesiac Mandus trying to recover his memory. The game ends with that spirit tricking Mandus into switching on the machine and releasing a squad of mutant pig men onto the streets of London to fetch victims to feed into the machine, only for our protagonist to kill himself so that the spirit and the machine die alongside him and the course of time is shifted back to its original trajectory. I have stood knee deep in mud and bone and filled my lungs with mustard gas. I have seen two brothers fall; I have lain with holy wars and copulated with the autumnal fallout. I have dug trenches for the refugees; I have murdered dissidents where the ground never thaws and starved the masses into faith. A child’s shadow burnt into the brickwork. A house of skulls in the jungle. The innocent, the innocent, Mandus, trod and bled and gassed and starved and beaten and murdered and enslaved. This is your coming century. That Mandus would attempt to correct a course to destruction he helped create at the cost of his own life reveals unexpected nobility and a sincere desire to triumph over inner demons of the sake of others even if things are still…well, we all know how the 20th century turned out. More than a few wars, countless dead, and several close calls with nuclear warfare later and we’re still here, arguably limping toward our own collective destruction And yet even in all that doom, Mandus’ decent, painfully human qualities shine through, that earnest desire to right the wrongs of the past and burn away our sins. There’s a splendor there that can’t exist without the ugliness or the despair. Mandus, like Hamlet, Bulgakov’s Master and Gaius Baltar before him, represents the best and worst of humanity all at once. Both A Machine For Pigs and Dear Esther are games that could be described as bleak and no one who’s played them would probably bat an eye. However, it’s interesting that both share a narrative structure usually associated with more optimistic stories. We go on a journey, descending into a literal underground, commonly a symbol of hell and the nastiness that lurks within ourselves, and then take flight at the end of the game, a literal uplifting of each game’s protagonist. Mandus ascends heavenward as he delivers his final monologue before the fade to black. As for Dear Esther? We climb the radio tower while the narrator talks about the mysteries of the island and alludes to his approaching death in a way that suggests he’s accepted his fate and is at peace with it, an eerie calm in the face of destruction. When we finally reach the top of the tower we dive, plummeting toward the ground only to take flight at the final second, soaring above the long trail we’ve walked as we fly away from the island, away from misery and death and loneliness only for the narrator, in the end, to whisper come back right as the game cuts to black. And I do. I must. It’s only a matter of time. I will return to walk the candlelit trail into the caverns and to gaze at the ruptured belly of a washed up tanker and ponder how I may usher all the hate and fear within my heart into a necessary but all too brief oblivion.